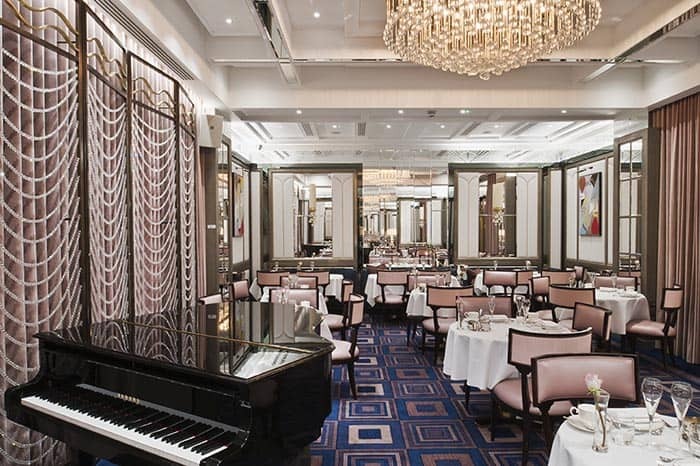 Jazz Lounge at the Wellesley Hotel in London. Janis Turk photos. 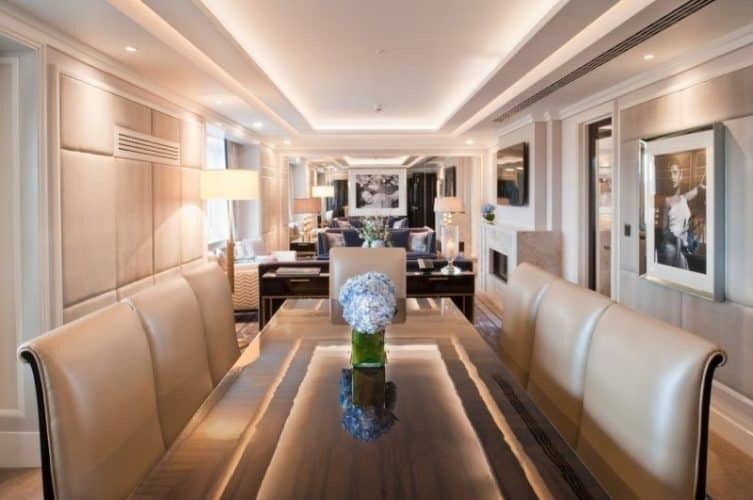 e was the entrance to Hyde Park Corner Tube station, close to Buckingham Palace between Green Park and Hyde Park, The Wellesley offers a little luxury cocoon of calm and elegance in the heart of England’s largest and most sophisticated city. Guests are instantly made to feel at ease—like coming home—upon entering this stylish London townhouse-style property of 36 rooms (most being suites), and many remember how for decades the space was home to London’s popular jazz salon, Pizza on the Park.Today this hot address boasts a posh little champagne- and candle-colored boutique hotel accented with sparkling touches of Art Deco glamour. The Wellesley One Bed Suite Bathroom. Often referred to as a six-star hotel, The Wellesley features tasteful rooms and suites, cloud-like beds, fine dining and exceptional staff, including personal butlers and to unpack your bags, press your suit, draw your bath, chill your champagne and more. But best of all, The Wellesley offers guests complimentary transportation to nearby locations in a chauffeur-driven Rolls-Royce. With impeccable service and a staff/guest ratio of 3-1, the hotel flaunts a grand hotel style on a boutique hotel scale. So how might The Wellesley change one’s mind? The Wellesley Penthouse Private Dining. It’s the realization that one gets, in a place so posh and polished, that there is indeed a different way to travel, and perhaps even to live: a way of true rest and rejuvenation. 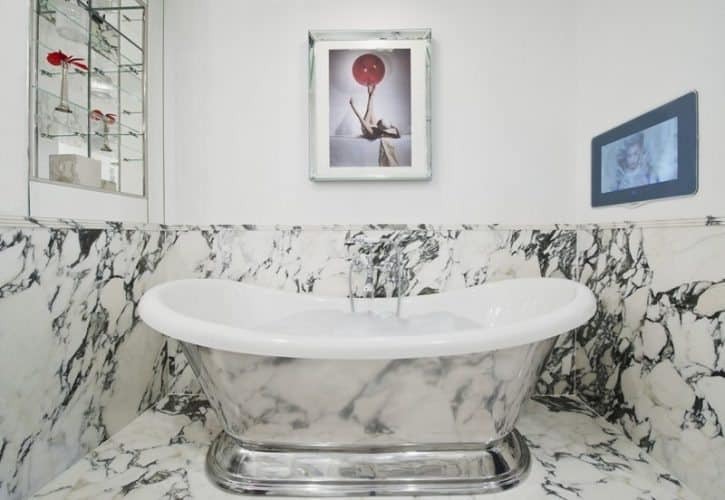 Here guests are reminded that beauty can be soul-soothing, and that quiet, clean luxury—even in one’s own modest home—is restorative. Sure, such epiphanies in a hotel like The Wellesley come at a dear price point, but if and when one can splurge on travel, this is the place to do it. Part of the hotel’s charm is that, in a city as big and bustling as London, The Wellesley is so tranquil and tiny. The slender lobby (a long corridor with high arched ceilings, glittering oversized chandeliers, classic columns, and gleaming floors of Italian marble) ends in a wall of mirrors, and tucked away on each side of the lobby are intimate lounges and dining rooms. Although the lobby is small, the suites are spacious. With a gleaming Art Deco/Hollywood Regency glamour, the rooms, suites, and handsome hallways remind me of The Gatsby Suite at New York’s Plaza Hotel.Each named for old-school Hollywood stars and jazz musicians, the rooms were designed by Fox Linton in taupe and silver tones, with champagne colored curtains and bedding, blackout draperies, Italian sheets, and large bathrooms of heavily veined white Italian statuary marble. Downstairs just off the hotel’s Wellesley Cigar Lounge, a heated terrace offers covered outdoor seating with a fireplace, all intimately protected from view by hedges of green. It also has a walk-in humidor featuring the finest cigars in London, many purchased at exclusive private auctions in Cuba, some being 60-70 years old, and some even hand-made by Fidel Castro’s private cigar roller. Across the hall, the Crystal Bar offers rare, aged cognacs (one dating back to the 1770s) and outdoor seating in a private, roof-covered courtyard warmed by a gas fireplace. The Wellesley’s Oval Restaurant features authentic Italian cuisine and a carefully curated wine list, and each day, afternoon tea is observed in the Jazz Lounge with delectibles from pastry chef Cristiano Paolini. The lounge also has live jazz performances on Friday and Saturday nights. Hotel owner Khalid Affara says he hopes guests will think of The Wellesley as their London home. I like to think of it as the home I’ve always longed to have in the London I’ve always loved. Janis Turk is a travel writer and photographer living in Seguin, Texas, near the capital city of Austin. Read more of her stories on GoNOMAD. Janis Turk is a travel writer, photographer, and author who has appeared in travel segments for CNN’s airport network. Her work appears in magazines and newspapers and popular travel websites. Her most recent book Frommer’s TEXAS (2017) is available on Amazon.com and in bookstores everywhere.